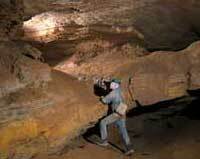 My interest in caves was sparked by an article in The Washington Post in 1956 about caving in West Virginia. I discovered the UVa Cave Club when I entered The University later that fall. 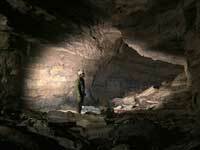 My first trip was to Sinnett Cave in Pendleton County, WV, on 28 October 1956. You may read more details about that trip and how I got interested in caving. 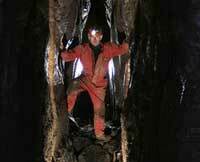 I celebrated my 50th anniversary of caving with a return to Sinnett Cave on 28 October 2006. Caving remained my main avocation from 1956 until 1963, when I discovered whitewater canoeing. Since then I have gotten underground only occasionally, though more so in the last few years. I joined the Butler Cave Conservation Society and have worked on several projects around Butler Cave and the Burnsville Cove, which is one of the premier cave areas of the world. Below are several photo galleries on Butler, Sinnett, Water Sinks and other caves in this region. I will add more pages as time permits. This might have been my first cave trip in Highland County, 21 March 1959. John Harshbarger from VPI and George Mabry and I from UVa visited New House Cave near Blue Grass. The entrance is a pit in the top of a hill with an opening about the size of a manhole. 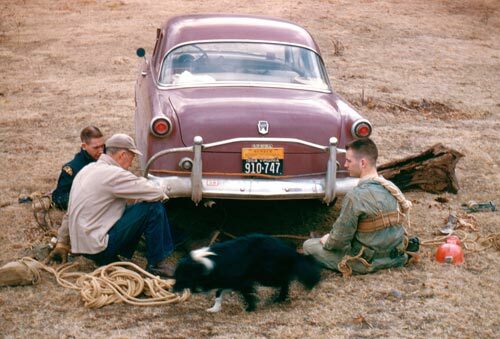 There being no tress nearby, the rope was rigged to the rear axle of my car. The cave owner, Jason Newman, showed us the entrance. He is on the left in this photo, wearing a cap. Harshbarger is behind him and Mabry is on the right. Newman’s dog blocks the view of the entrance hole itself. This photo and description was published on the Times Past page of The Recorder, 3 December 2004, p. 41. I dropped a carabiner down a crevice while in the cave. I could see it but not reach it. Anyone who finds it now is welcome to keep it. The Recorder also ran a very nice article about caves by Matthew Campagna in its Fall Guide section on 8 October 2004. It was based largely on an interview with Phil Lucas and contained several photos, which, sadly, are not included in the PDF version of the article available here. However, an exhibit of photographs by Phil Lucas was shown at the Highland County Public Library in November 2006, a few of which are available on line. An article in the Jan-Feb 2007 Blue Ridge Country magazine mentions Bath County caves and includes two of Phil’s photos. This may not be a permanent link but a printer-friendly (pdf) version is available here. [136 kB] A few typos have also been corrected. The Recorder is running a series of articles on caves and karst thoughout 2009. The first of these articles, Living on hollow ground, appeared on 15 January and is available from The Recorder’s web site. The second article, Echoes underground, appeared as part of the Spring Guide on 5 March. It is available as a pdf file [738 kB] here. The same issue contains an article, White nose syndrome found in area bats, which will also be of interest to cavers. I will post future articles in the series as they appear. Click on the small photo at left to enter each gallery. Gallery 11 contains photos from a trip into Butler Cave in March 2008. Not really a photo gallery, this page provides links to information on White-Nose Syndrome in bats. There are two photos as well as the external links. A lot has changed since this was posted 2008 but this page has not kept pace. Gallery 10 contains trip reports on the exploration of the Water Sinks in Highland County, VA, in January and February 2008. Exploration is now complete unless something new opens up. Gallery 9 contains eight photos from a trip into Helictite Cave, Highland County, VA, in December 2007. 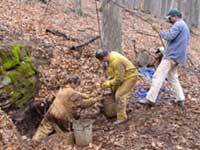 Gallery 6 has several photos of cave digging and exploration on Chestnut Ridge in Bath County, VA, March 2007. Gallery 5 has two photos from a 1901 trip to Sinnett Cave and includes some historical data on the Sinnett family.